The latest iOS 11.2.6, macOS High Sierra 10.13.3, watchOS 4.2.3 and tvOS 11.2.6 updates remedy a nasty text rendering problem discovered last week. At the time, device users who received messages containing a particular Telugu character would experience iOS Springboard and app troubles, including Apple's own Messages and Safari. Third party apps like Gmail, Outlook, WhatsApp and Facebook Messenger were also impacted, as were Twitter clients. Once received, the character triggers apps to crash and remain unusable until the offending thread is deleted. Over the weekend, unsavory types tweeted out the Telugu character as part of an insipid prank on iPhone, Mac and Apple Watch owners. Other reports noted people were sending messages containing the text to their friends to achieve similar ends. Apple addressed the issue last week, saying that while beta versions of iOS 11.3 and macOS 13.13.4 resolve the problem, the company intended on issuing patches as soon as possible. In addition to the critical text rendering bug, today's iOS update fixes a bug that caused certain third-party apps to fail to connect to external accessories. 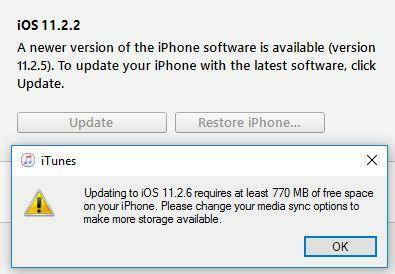 Users can download iOS 11.2.6 by navigating to the Software Update section of the Settings app, while macOS users can download macOS High Sierra 10.13.3 via the Mac App Store. The latest Apple Watch firmware can be found in the Watch iOS app under, and tvOS 11.2.6 is available from the streamer's Settings app. Updated iPod and iPhone. Straightforward enough. Now the wait continues for iOS 11.3! Mr Tim , please can you bring iAds back ? I want Apple to fix online ads. They got this fix out fairly quickly. I wonder what they learned from it? One would think that their UTF-8 and UTF-16 support was already solid. Are there any indications what accessories Apple is talking about with the 2nd feature called out in the readme file? "Fixes an issue where some third-party apps could fail to connect to external accessories"
I'm a bit curious about how the patch process for this update works on macOS. The download image is quite small but the installation time is quite lengthy. On my relatively "old" 2011 MacBook Air the update took only a few minutes to install. On my 2013 iMac (fusion) and 2014 Mac Mini (HDD) the updates have been crawling along for about 20 minutes - so far, and the progress bar still says 18 more minutes. It's almost as if some major chunk of the OS is being rebuilt. No doubt that whatever is going on must be very disk intensive. Hopefully this means the Smart Keyboard on the iPad Pro which appears to have had a lot of problems on iPad Pro. I have two and both have been flaky since iOS 11. I hadn’t isolated it to third party apps though, it seemed to be a problem across all apps. I had this issue too, but only with the with the first model of the iPad Pro. I purchased a newer one a coupe of months ago, and have not — fingers crossed — had the problem yet. the updates have been crawling along for about 20 minutes - so far, and the progress bar still says 18 more minutes. Same for me on a late 2015 5K iMac. Wonder if this will fix the HomePod randomly not connecting to the internet for hours at a time....I have 2 homepods and they take turns not connecting to the internet during random blocks of time throughout the day....I’ve tried everything for a fix. How the hell does a character crash the OS? How about some interesting and relevant information? I have a Amazon Echo and and Google Mini to play around with. I have to say I had Internet connection issues with the Google Mini. It would work fine, then come back a day later and try to use it and it would fail. So I'd unplug it, than plug it back it, it would boot up and then work just fine once again. Not sure why, though I do have a ton of devices, is I switch it from my 2.4Ghz network to my 5Ghz Network and that issue seemed to go away. Not sure why as 2.4Ghz is stronger at a greater distance than 5Ghz which is faster at a shorter distance. It seems to have done the trick. So have you tried that? Gotta love the speed of SSDs. Even on your "old" MacBook Air it's way faster than a HDD/Fusion Drive. Newer MacBooks use ever faster SSDs. Your daily update and bug fix courtesy of Apple Inc. I'm glad to see they have the mind to patch this thing, it cost me a lot of time when working with Indian texts and fonts on Mac.